The so-called Fortune Wells were a bunch of wells that were scattered in solid parts of the marshland. They were all of different sizes, and were separated from each other by different distances. Each and every one of them stood on a small piece of solid ground, so people wouldn’t need to worry about sinking in the marshland. By the time Nie Tian and the others arrived, six of the forty-nine Fortune Wells had already been claimed by six different people. Those six wells were all more than three meters wide, and the largest one seemed so deep that it looked like an unfathomable hole that led all the way to the earth’s heart. Sitting by that well was an old man with gray hair. He was at the late Profound realm, and from the look of it, he had lived for a rather long time. Chai Longge stopped his air-transportation spiritual tool in a place that was still a considerable distance from the old man. With his unique bloodline power, Nie Tian examined the old man from afar, and shrewdly discovered that, similar to Wu Ji, he was having a problem with his lifespan. Even though the old man had lived for very long, his cultivation base had only reached the late Profound realm. If he couldn’t break through into the Soul realm and gain more years, his path of cultivation would soon come to an end, along with his life. The old man’s eyes were closed, and his flesh aura was very weak, yet the spiritual power fluctuations he emanated were exceptionally strong. Nie Tian gaze then swept over the other five Qi warriors, and discovered that they were all at the Profound realm too. Some of them were rather old, while others were still quite a long way from reaching the end of their lifespans, judging from their flesh auras. The six of them had occupied six of the largest Fortune Wells. Three of them looked up and shot them a glance from afar, and then resumed their cultivation. Nie Tian fixed him with a curious gaze. “They may swap wells with others. If they can find people with wells that provide the kinds of power they need, and reach a mutual understanding with them, then they can swap wells.” Chai Longge’s voice grew even lower as he pointed at the old man. “For example, he practices lightning power. The man beside him practices water power. After hearing these words, Nie Tian realized that it wasn’t first come first served with these Fortune Wells. People couldn’t always keep the well they had occupied. If the Martial Spirit Sect had learned that the Fortune Wells were going to become active soon, sects from other domains, outsiders, and even Ancientbeasts could have learned about it too. It was very likely that fierce battles would break out when the Fortune Wells actually become active. Many mishaps might occur, making it difficult to actually gain fortunes from these forty-nine Fortune Wells. Nie Tian didn’t need him to finish his sentence to know how deadly those fights were going to be. Fortunately, the three of them all had powerful backing or resources, and thus weren’t very worried. Yin Yanan let out a snort as she took the initiative to jump off the air-transportation spiritual tool. She landed and sat down by a fairly large Fortune Well, demonstrating her claim over it. Afterwards, Mu Biqiong landed beside another relatively large Fortune Well, claiming it. Nie Tian randomly chose a Fortune Well and also sat down. Chai Longge and his sister also chose two Fortune Wells, which weren’t far from Nie Tian and the girls’. Nie Tian and the girls nodded in assent. Nie Tian had long since realized that the incantations Mu Biqiong practiced were closely related to wood power, which might have a great deal to do with the demonic plant growing inside of her. Yin Yanan, on the other hand, practiced frost power, because her Frost Blood Python’s Frost Python bloodline allowed it to command ice and frost. At the same time, the special body refining incantations she practiced agreed with the Frost Blood Python’s Blood Stripe Python bloodline, allowing her to absorb and refine spirit beast blood into herself. Among the three of them, Nie Tian practiced the most powers, as he practiced flame power, wood power, and star power at the same time. Chai Longge might be able to sense flame power and wood power from him, but he might not be able to tell that he also practiced star power. The fact that Chai Longge had invited the three of them to seek fortune from these Fortune Wells together was because he had realized that the three of them weren’t powerful enough to threaten them. Also, since none of them practiced metal power or water power, once the Fortune Wells became active, his and his sister’s chances at getting wells they needed would improve significantly. Of course, this was based on one precondition: they would have to be able to hold on to their Fortune Wells. The Fortune Wells they had chosen were quite far from the early-arrivers’. Nie Tian stepped to the mouth of the Fortune Well he had chosen and gazed down. He discovered that it was dark and unfathomable, as if it led to the heart of the earth. He then sent a wisp of soul awareness into it, but failed to sense anything noteworthy even till his soul awareness reached the limit of his detection range. After withdrawing his soul awareness, he shot a sideways glance at Mu Biqiong and Yin Yanan, and discovered that the two fierce women were also observing their Fortune Wells, but just like him, they didn’t seem to have found anything either. Afterwards, Nie Tian settled down and sat down beside his well, where he took out spiritual materials and began practicing cultivation. Soon, days passed, and newcomers arrived. Among them were human cultivators, Demons, Fiends, and even an Ancientbeast. That Ancientbeast was a sixth grade Earth Flame Beast, whose strength was equal to that of a Profound realm human expert. Many years ago, Nie Tian had witnessed an Earth Flame Beast charging out of the depths of the earth in the Scarlet Flame Mountain Range, and that sixth grade Earth Flame Beast had greatly shaken his young heart. However, after so many years, that kind of power could no longer cause any waves in Nie Tian’s heart. After arriving, the huge Earth Flame Beast descended by one of the Fortune Wells and stayed there, its three flaming tails slithering like fiery snakes. None of the humans and outsiders present paid any special attention to it, as if they didn’t find its arrival surprising at all. Pergson, Froste, and Gutas weren’t among those who arrived. A few more days passed, and a young man arrived, riding a sixth grade Thunder Beast. He was dressed in eye-catching, colorful garments, and behaved in an unrestrained manner. Five thunderballs could be seen on the young man’s chest. They seemed to have been embroidered on his robe, yet they rotated unceasingly, which was rather curious. With an unruly look on his face, he glanced around, sitting astride his Thunder Beast, and soon noticed the late Profound realm old man, who was guarding the largest Fortune Well. His cultivation base was only at the middle Profound realm, which was lower than the old man’s. The old man opened his eyes. His expression flickered as he saw the five rotating thunderballs on the young man’s chest. A shred of anger flashed across the old man’s eyes, but he rose to his feet and went to sit by a fairly distant Fortune Well. However, he didn’t say a word the entire time. The young man grinned as he landed his sixth grade Thunder Beast by the largest Fortune Well. Then, gazing disdainfully at the old man, he said, “Now that’s the smart thing to do. If three or more of these Fortune Wells spew lightning, then I’ll grant you one. The face of the old man, who was eager to extend his lifespan with the help of that fortune Well, grew gloomy after he heard these words. Eyebrows furrowed, Chai Longge fixed the young man with a measuring gaze as he explained his origin to Nie Tian, “He’s Mo Qinglei, the future sectmaster of the Heavenly Thunder Sect in the Domain of Endless Thunder. “If the Fortune Wells you’ve claimed happen to spew lightning, you’d better back away voluntarily in order not to offend that guy. The current sectmaster of the Heavenly Thunder Sect is at the late Saint domain. Yin Yanan snorted a disdainful laugh. Mu Biqiong’s expression remained as calm as ever. Chai Longge had a confused look in his eyes as he saw Nie Tian and the girls’ attitude. He could tell that Yin Yanan’s Frost Blood Python was at the eighth grade, and that Mu Biqiong had a demonic plant growing inside of her. However, the Domain of Heaven’s Boundaries was only an elementary-grade domain, so he naturally didn’t reckon the three of them could actually contend against Mo Qinglei from the Heavenly Thunder Sect. Luo Hui from the Heavenly Witchcraft Sect arrived, riding his golden spider. As soon as he did, Nie Tian and the girls exchanged a glance, and faint smiles appeared on their faces. Luo Hui’s expression flickered as he spotted Nie Tian and the girls among the people who had arrived. A talisman is a physical object, it contains non-physical energy inside, just like how air is contained inside a balloon. When air is filled up inside, it will let the balloon gives off light. When air is released out of it, the air then get absorbed by the things around it. Try to imagine the talisman just like a balloon, and you will know how to make the best use of it. 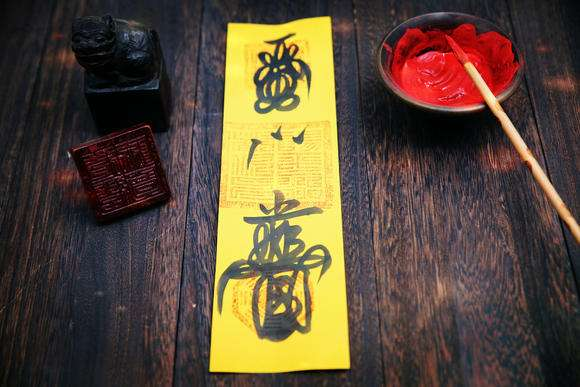 Tape – Tape the talisman at home, or near anywhere that needs the light to radiates and shine to influence the surrounding, or to protect the area. Carry – Same effect as above, but this one is next to you, and it help you no matter where you go! Burn – This will release the energy inside, and so if you burn it at the main entrance of your house, the house will absorb the power. Just like how you absorb medicine, then you get the effect kick in. Drink – Energy is released into a bowl, and then contained into water, which then you can drink to let it go into your system and there goes the effect inside you.